Since the Bribery Act was passed, GoodCorporation has been testing the adequacy of procedures using the GoodCorporation Framework on Bribery & Corruption. 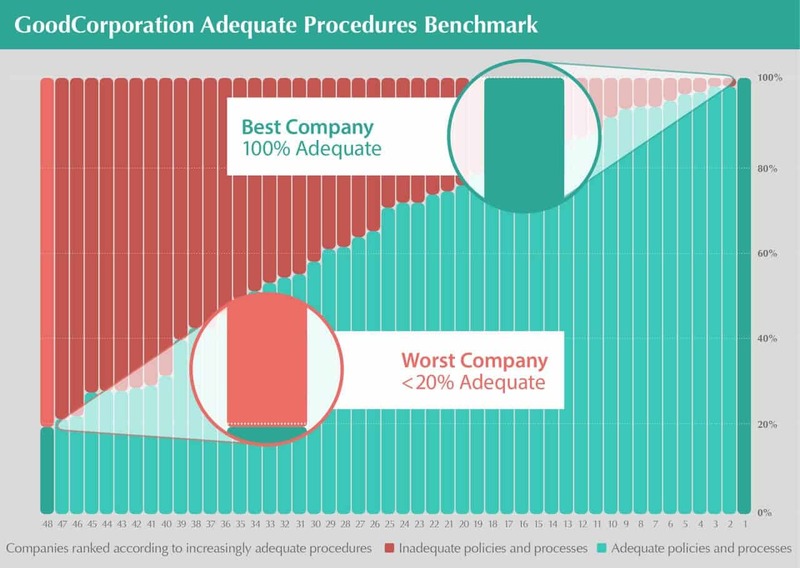 Over 6,000 anti-corruption procedures have been assessed and compiled into the GoodCorporation Adequate Procedures Benchmark. Analysis against the benchmark can be used to assess the relative strength and weaknesses of ABC controls relative to other organisations or within the group. Companies can assess performance against the best and worst performers to see where their company sits in the benchmark as a whole. Our matrices also allow companies to compare the implementation of adequate procedures across business areas. We can also provide a scoring profile against the benchmark as a whole for dashboard reporting to senior management.